Pollinators, most often honey bees, are responsible for one in every three bites of food we take! The loss of pollinators threatens agricultural production, maintenance of natural plant communities and important services provided by those ecosystems, such as carbon cycling, flood and erosion control, and recreation. The Centerville-Washington Park District is committed to making a difference. 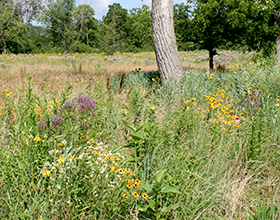 We have actively established pollinator habitats in many of your parks. This spring, we seeded more than 30 additional acres of pollinator habitat. Much of the habitat was created by planting native grasses and flowering plants in park areas that have traditionally been maintained as mowed turfgrass. Look for the new habitats in Beechwood Springs, Cherry Hill, Elizabeth Hoy, Grant, Holes Creek, Old Lane, Pleasant Hill, Quail Run, Robert F. Mays, Silvercreek, Village South and Waterbury Woods Parks. Please contact us if you would like more information or are interested in volunteering to help with the effort!